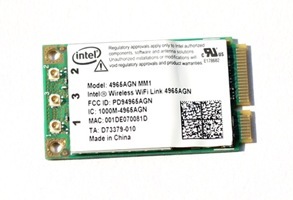 The Intel Wireless WiFi Link 4965AGN product is an embedded 802.11a/b/g/n PCIe Mini Card network adapter card that operates in both the 2.4GHz and 5.0GHz spectrum, delivering high throughput and a host of features that enhance today’s mobile lifestyle. Intel Wireless WiFi Link 4965AGN provides deployment flexibility and connectivity convenience by offering a quad mode (supporting 802.11a/b/g/n) product, which is capable of connecting to new "Connect with Intel Centrino processor technology" wireless N Access Points / Routers, but can also connect to any of the legacy Wi-Fi standards, 802.11a, b or g.
I have downloaded the drivers for Win7 32bit but windows insists the best drivers are the outdated v12.4.1.4 are the best drivers. I think these are left over from Vista after I upgraded to Win7. What subdirectory do these drivers install in? Nothing is indicated during the install process.